I've been stationed in Downtown DC for awhile now, so I felt it was about time to try some of the local Barbecue places I pass regularly. I think of BBQ more as a rural thing, but I had a hankerin'. 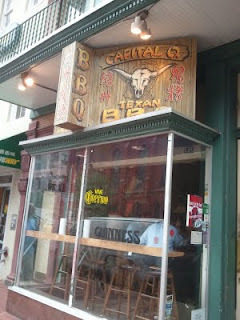 There are two within a short distance (3 blocks) of each other: Capitol Q on H street between 7th & 8th (Chinatown), and Hill Country on 7th between D & E (Penn Quarter). Both are Texas style, which makes them very much out of place from the local Virginia & Maryland styles nearby. No matter, it was worth a try. The first thing you notice is the size of the restaurant; it's small, but definitely not cramped. I found it cozy. Its unlikely you'ld find a seat, so plan on takeout if you go during a busy time. It's also very clean. We sat by the window, an excellent view of a busy corner, perfect for people watching. I ordered the brisket, which in my mind is the most obvious way to tell the overall quality of the food and ability of the smoke master. The meat was lean and cooked properly, and probably best enjoyed naked. I say this because the sauces, while decent, added nothing of real value to the experience. 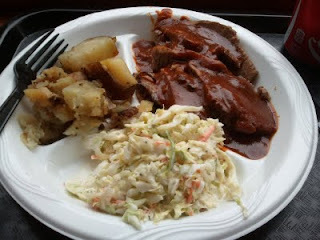 My fellow diners agreed; the meat was the star of the show, the sides were marginal, with a few exceptions: The smoked home fries were amazing! Stay away from the corn, or it may taint your experience. Overall, I agree with what I'd read from others on Yelp; a decent, albeit slightly expensive lunch destination. With the understanding that this is in Chinatown, you are fairly paying for the location.